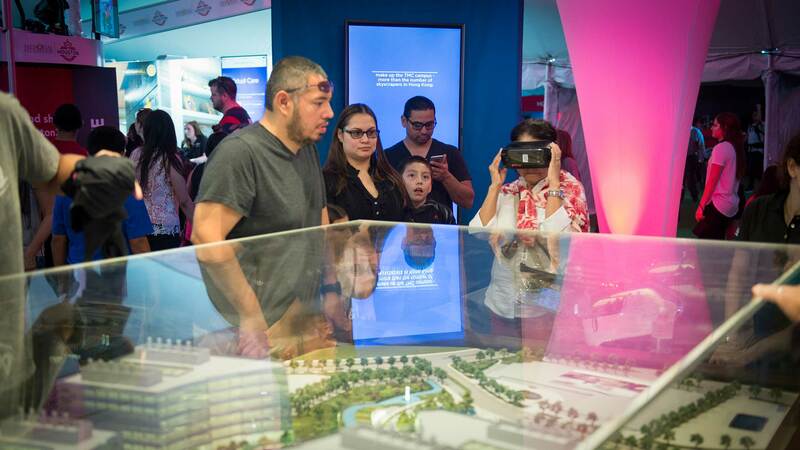 Create an immersive experience for guests by surrounding them with the cutting-edge technology of the Texas Medical Center and present a clearly articulated vision for the future – while they are standing in a parking lot at Discovery Green. The Houston Super Bowl Host Committee showcased the best of our city with Super Bowl Live, an on-going event on Discovery Green and in the George R. Brown Convention Center. The event was the heartbeat of Super Bowl activities for ten days leading up the big game. 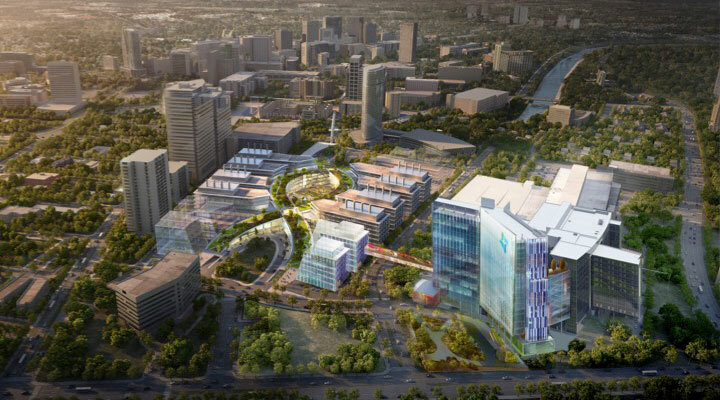 Staging Solutions was invited to partner with the Texas Medical Center, a innovative leader in the medical industry. 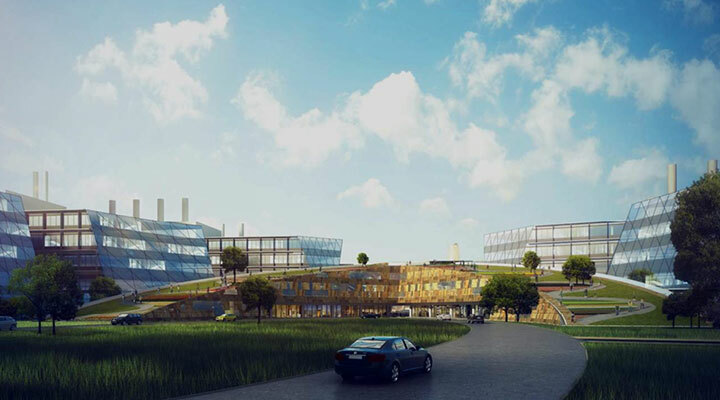 Together we set out to create a booth to showcase their most impressive programs as well as their vision for the future: TMC3 Innovation Campus (Helix Campus). 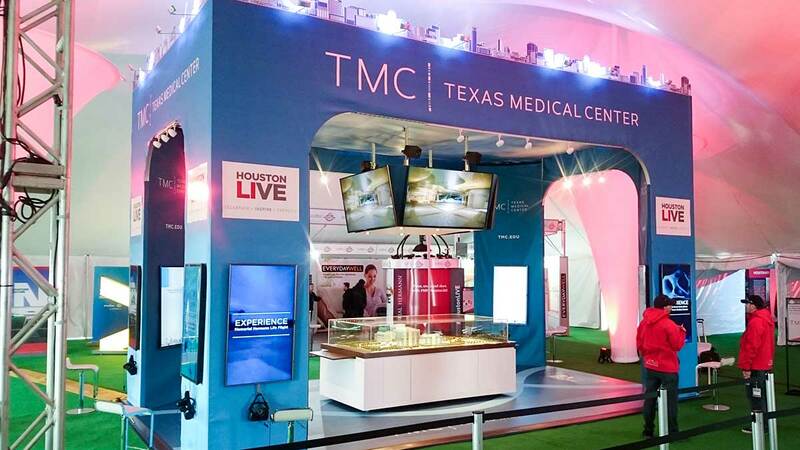 The TMC Experience booth was free of charge to the million+ visitors expected at Discovery Green. How do you pull all that off in a downtown Houston parking lot? Virtually, of course! An immersive journey through this groundbreaking artificial heart, narrated by the inventor himself. An exciting 360 degree tour of the helipad and the life-flight helicopter as it takes off over the Houston skyline. A tour of Baylor Medical Center’s self-sustaining medical clinics that are designed to be used in remote areas. An peek into how robotics are making great strides in the medical field and reducing trauma during surgery. 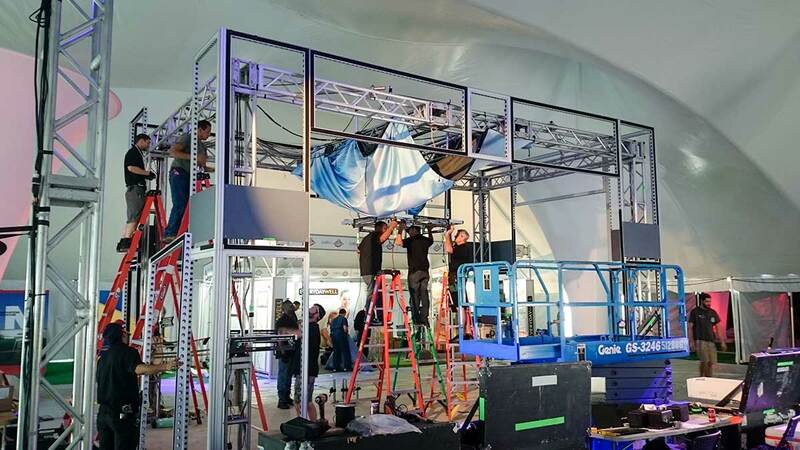 These components were housed in a custom-designed tent, featuring a pole-tent construction rather than the traditional post-and beam. The white roof fabric treated with lighting effects flowed gracefully from one pole to the next, creating a bright and futuristic environment. This gave guests a drastically different experience from its original parking-lot foundation. Like many Houston downtown parking lot, the surface is not level. The tent frame and graphics were supported separately to prevent distortion of projected images. 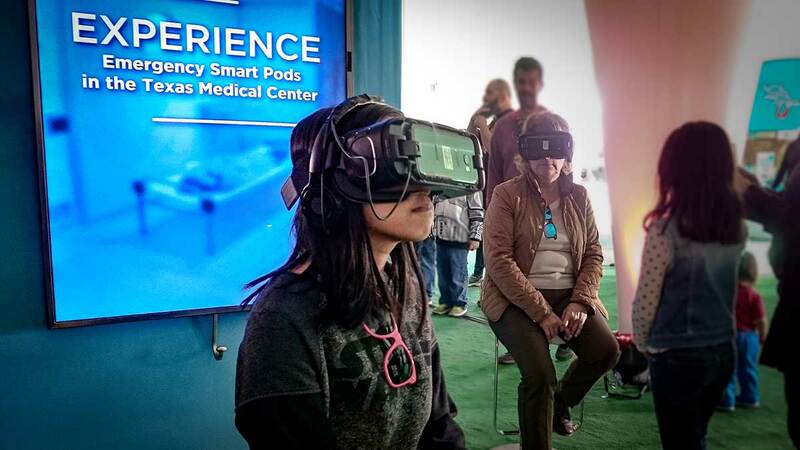 The tent was home to Samsung VR Gear headsets paired with Samsung Galaxy S7 mobile devices. 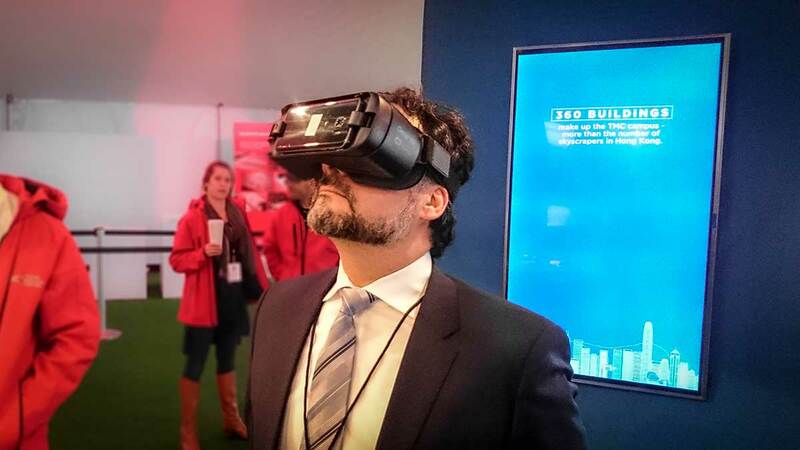 Units were set inside the booth’s perimeter, to allow simultaneous VR experiences for as many guests as possible. As overheating is a common problem for this type of equipment, addressing the challenge of having so many VR units in an outdoor environment was paramount. In anticipation of the high traffic and frequent usage, each unit was programmed to run only the custom-designed content, back-up units were available to sub in for any unit low on power or high on temperature, and first-aid cooling packs were used to relieve overheating units immediately. 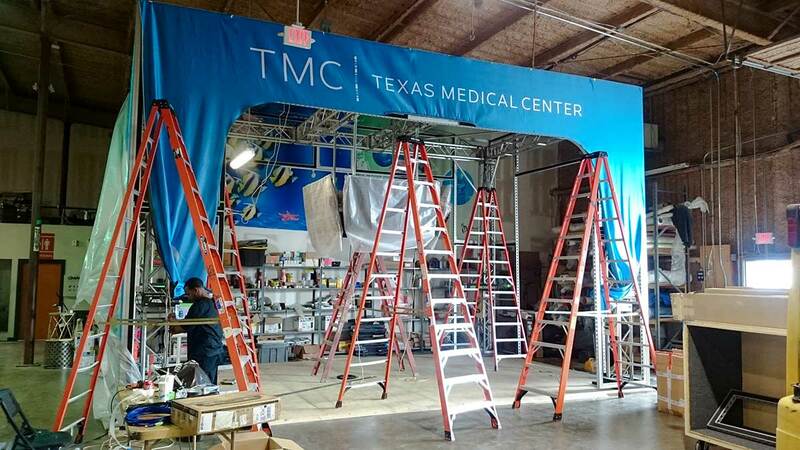 Designing and fabricating a booth like this, not to mention its internal components, usually takes 4-5 months; but the TMC needed their booth stat – so we performed a little triage and completed the task in eight short weeks. 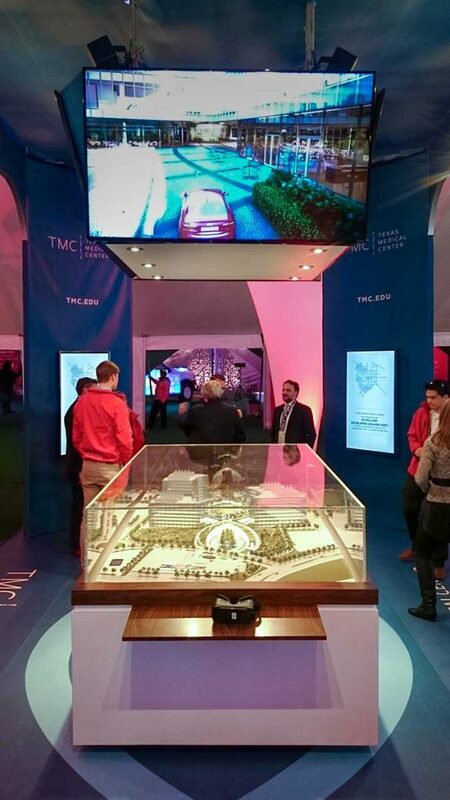 Fantastic, it was a huge success showcasing TMC’s cutting technology to the millions of patrons of Super Bowl LIVE! 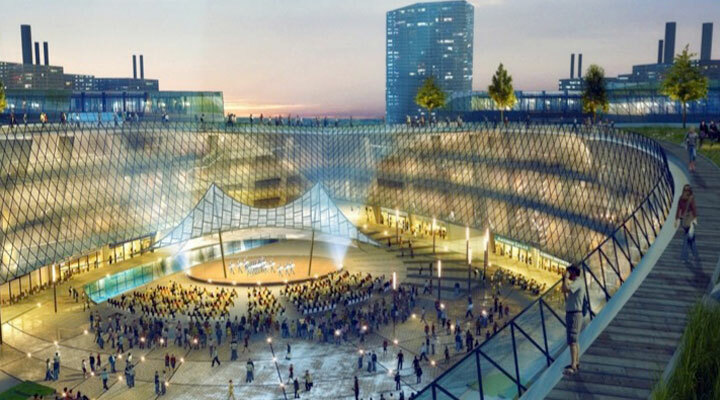 William McKeon, Executive VP, Chief Strategist & Operating Officer for the TMC called Staging a “great partner who has been outstanding throughout” the design and delivery of this project, and praised our “extraordinary work”.